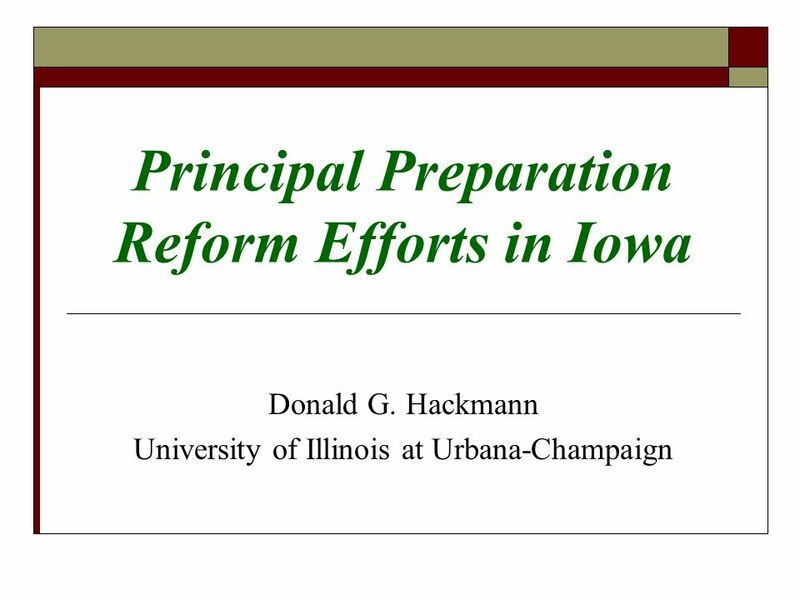 Principal Preparation Reform Efforts in Iowa Donald G. Hackmann University of Illinois at Urbana-Champaign. 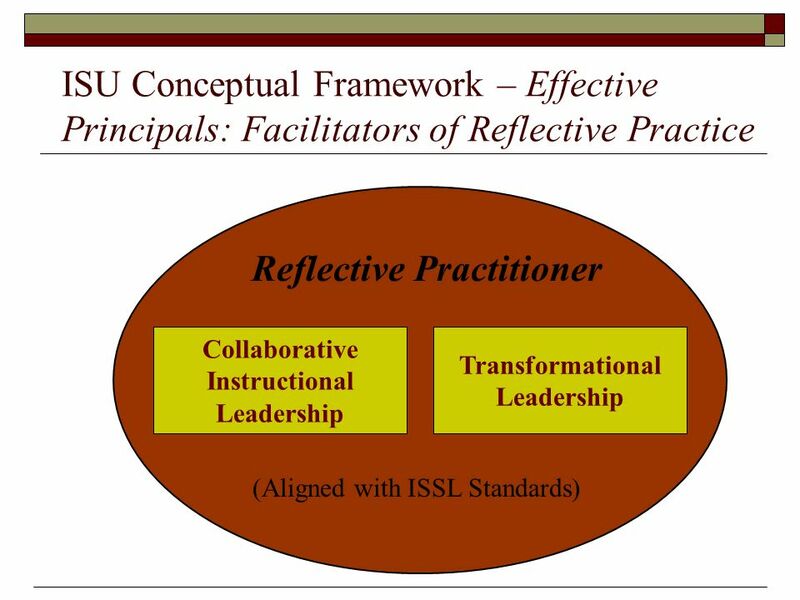 12 Conceptual Framework and Program Features Conceptual frameworks included: all five programs consistently portrayed four roles for the principalship: instructional leader, collaborative leader, reflective practitioner, and change agent. 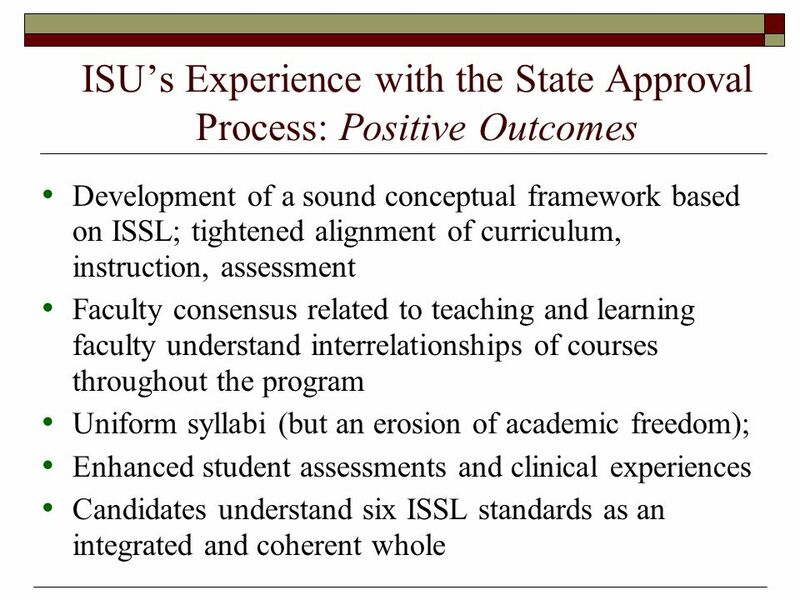 Programs designed for part-time students Cohort delivery model Review panel: Fully approved programs had well developed conceptual frameworks, with alignment in courses, syllabi, clinical experiences, and assessments. 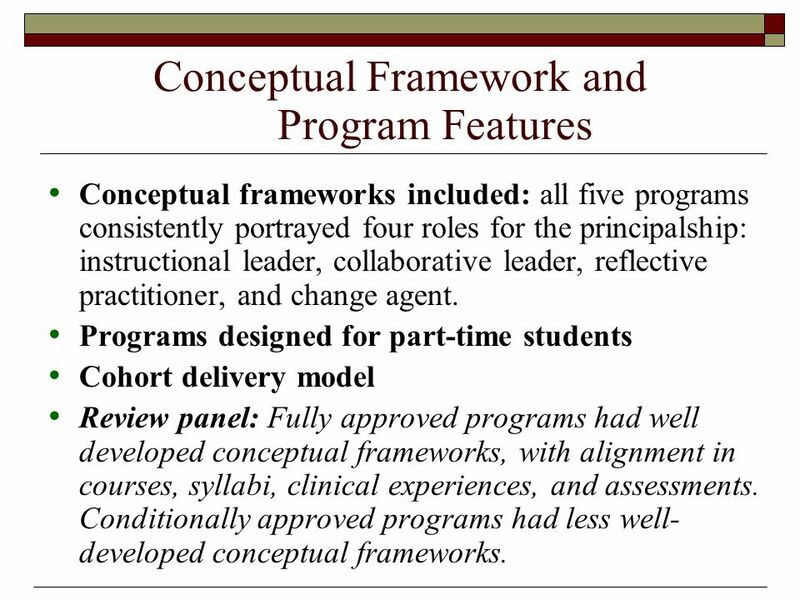 Conditionally approved programs had less well- developed conceptual frameworks. 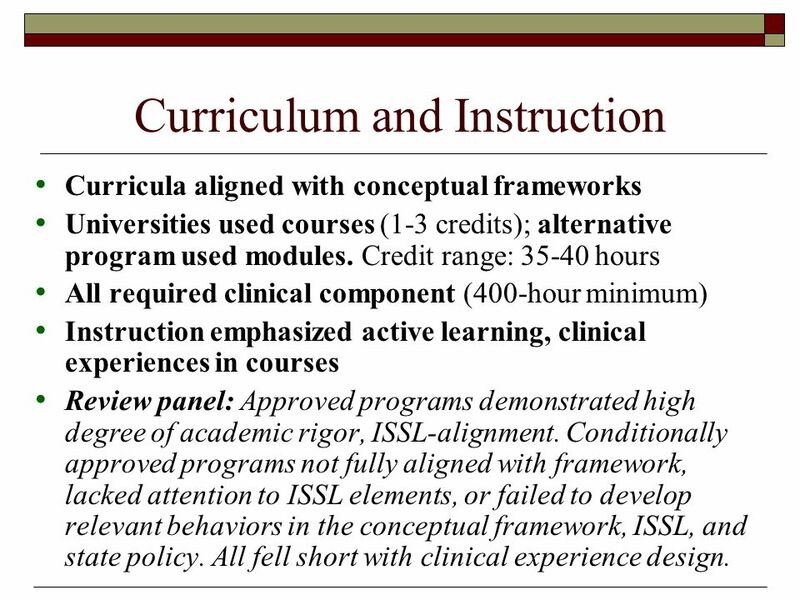 13 Curriculum and Instruction Curricula aligned with conceptual frameworks Universities used courses (1-3 credits); alternative program used modules. 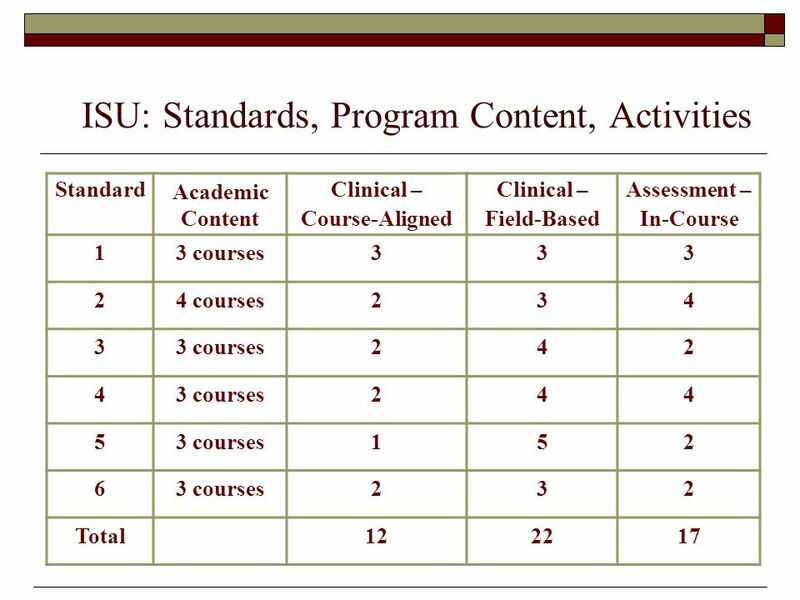 Credit range: 35-40 hours All required clinical component (400-hour minimum) Instruction emphasized active learning, clinical experiences in courses Review panel: Approved programs demonstrated high degree of academic rigor, ISSL-alignment. 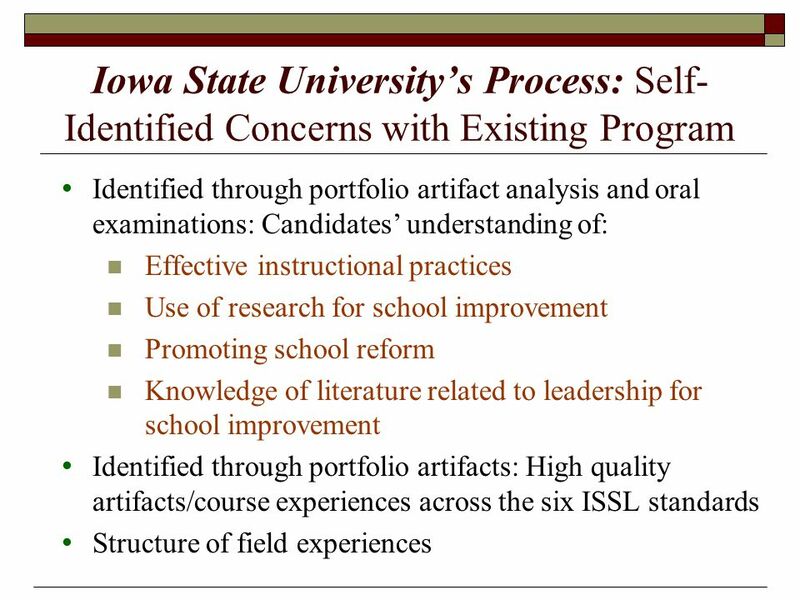 Conditionally approved programs not fully aligned with framework, lacked attention to ISSL elements, or failed to develop relevant behaviors in the conceptual framework, ISSL, and state policy. All fell short with clinical experience design. 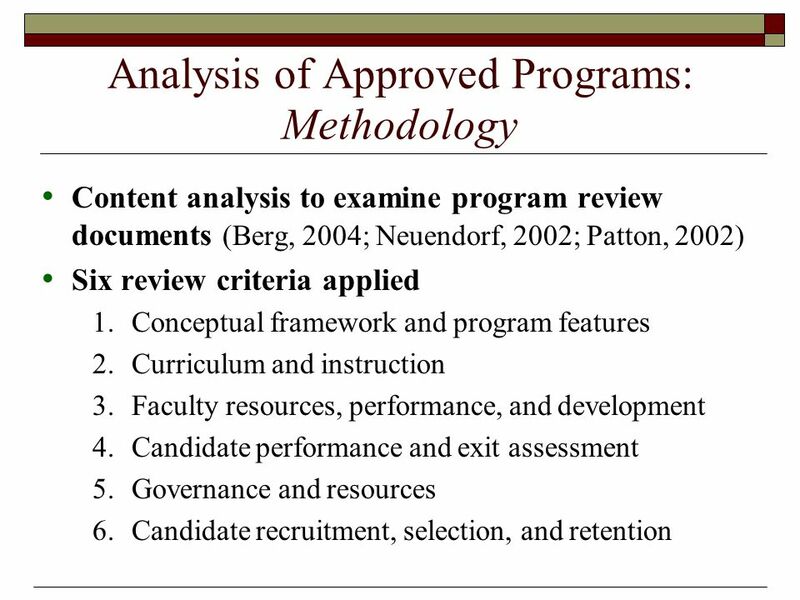 14 Faculty Resources University FTE: ranged from 4.0 to 7.25; all with doctorates, 14 (of 18) with administrative experience Alternative program: 1 full-time director, 19 expert faculty; 13 with masters degree, 9 with administrative experience Review panel: Noted UCEA Standard of five full- time faculty. 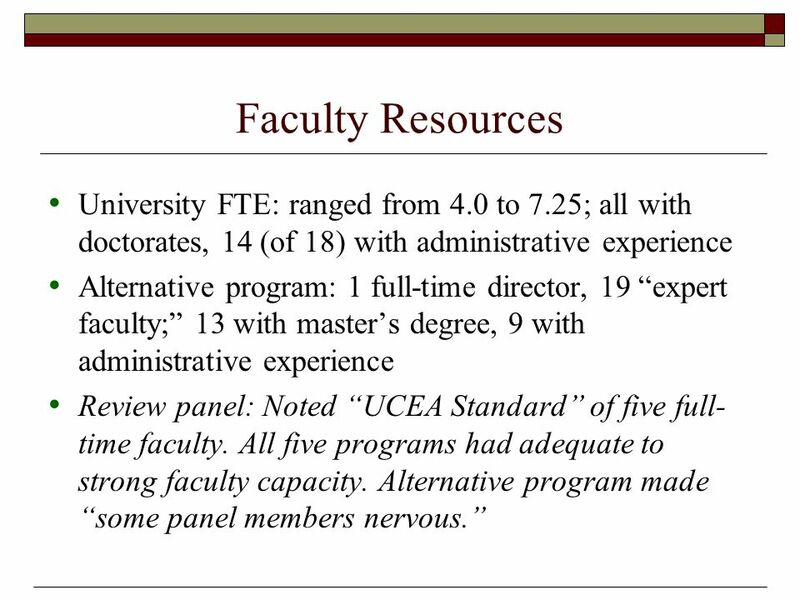 All five programs had adequate to strong faculty capacity. Alternative program made some panel members nervous. 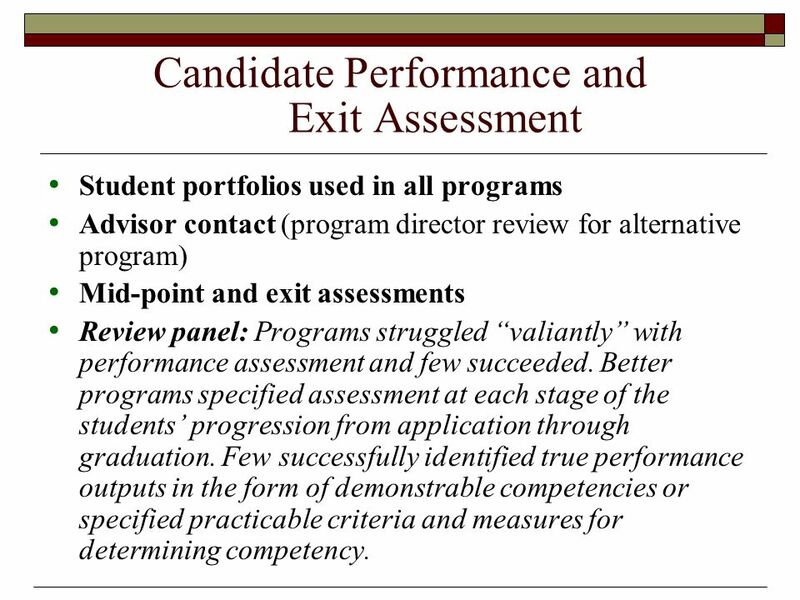 15 Candidate Performance and Exit Assessment Student portfolios used in all programs Advisor contact (program director review for alternative program) Mid-point and exit assessments Review panel: Programs struggled valiantly with performance assessment and few succeeded. Better programs specified assessment at each stage of the students progression from application through graduation. Few successfully identified true performance outputs in the form of demonstrable competencies or specified practicable criteria and measures for determining competency. 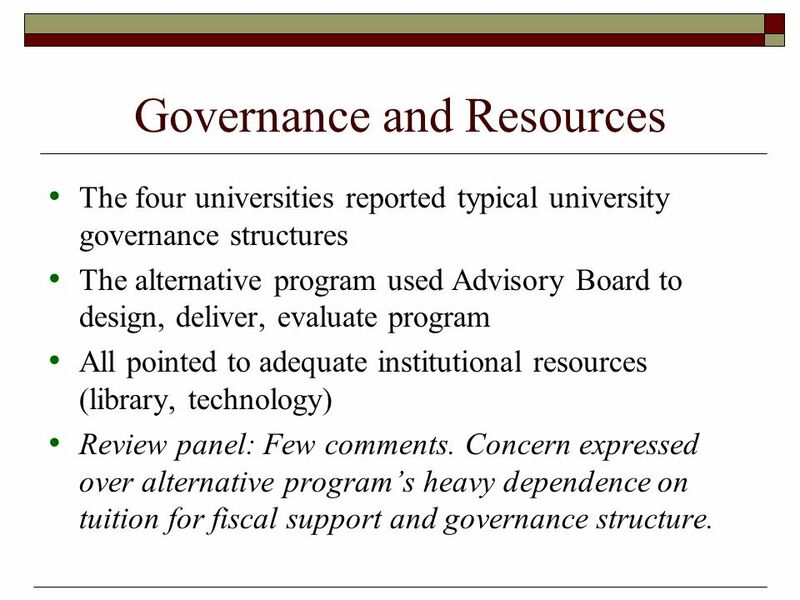 16 Governance and Resources The four universities reported typical university governance structures The alternative program used Advisory Board to design, deliver, evaluate program All pointed to adequate institutional resources (library, technology) Review panel: Few comments. Concern expressed over alternative programs heavy dependence on tuition for fiscal support and governance structure. 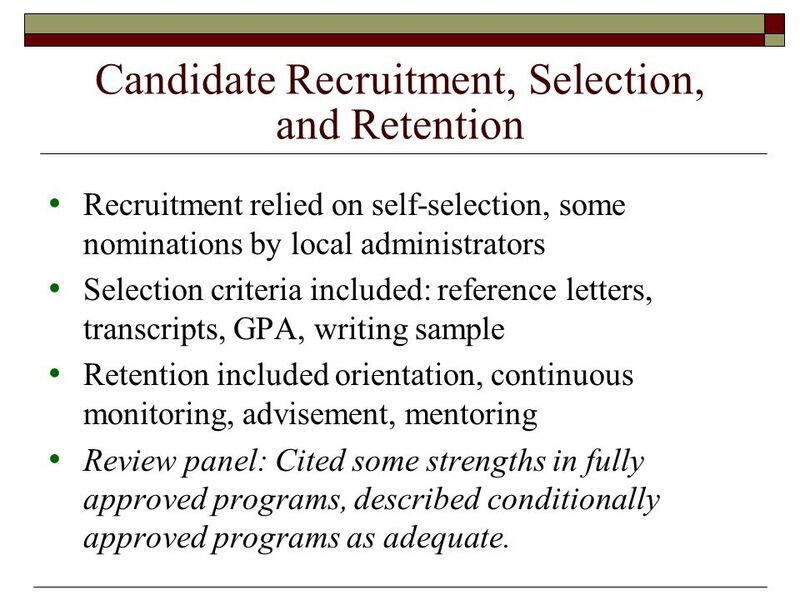 17 Candidate Recruitment, Selection, and Retention Recruitment relied on self-selection, some nominations by local administrators Selection criteria included: reference letters, transcripts, GPA, writing sample Retention included orientation, continuous monitoring, advisement, mentoring Review panel: Cited some strengths in fully approved programs, described conditionally approved programs as adequate. 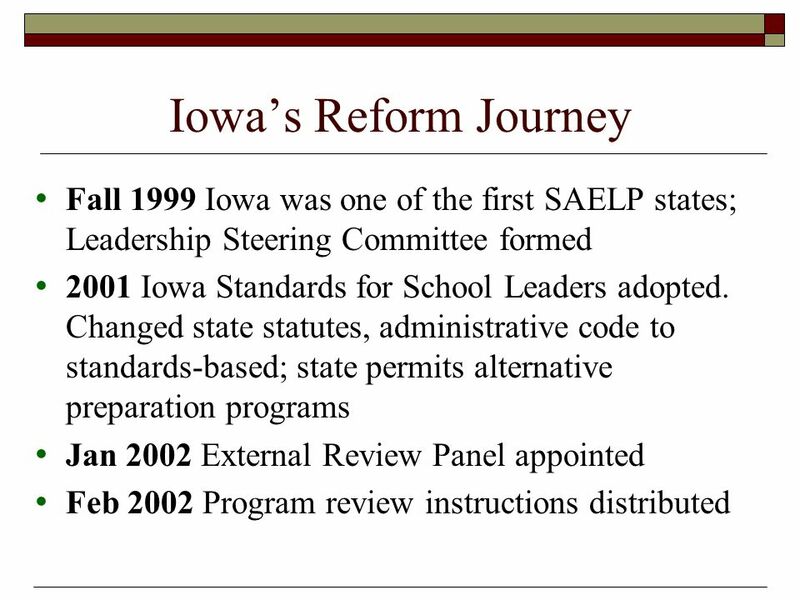 21 Conclusions Existing programs improved their existing programs, due to the state of Iowas increased rigor. 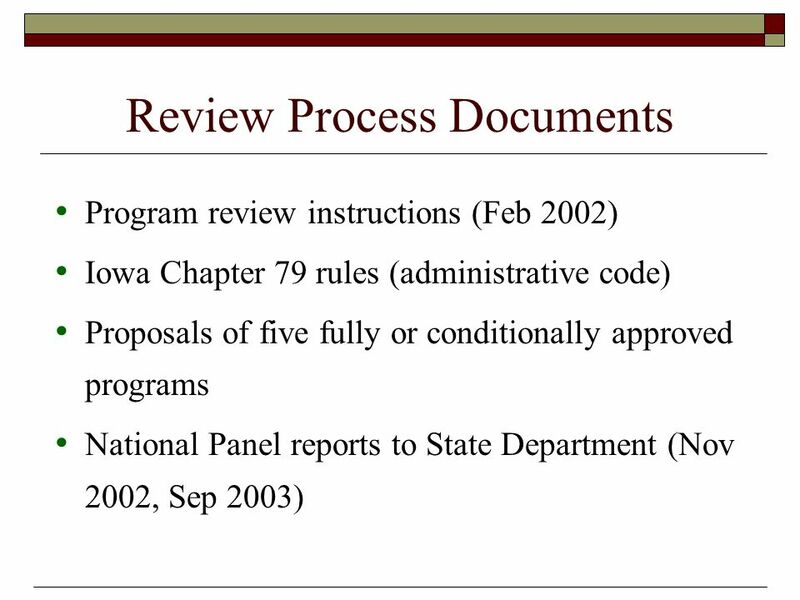 The use of the review panel provided an interesting component, in that the state relied on out-of-state experts to determine the program approval process, interpret state policies, and write the instructions and criteria for approval. 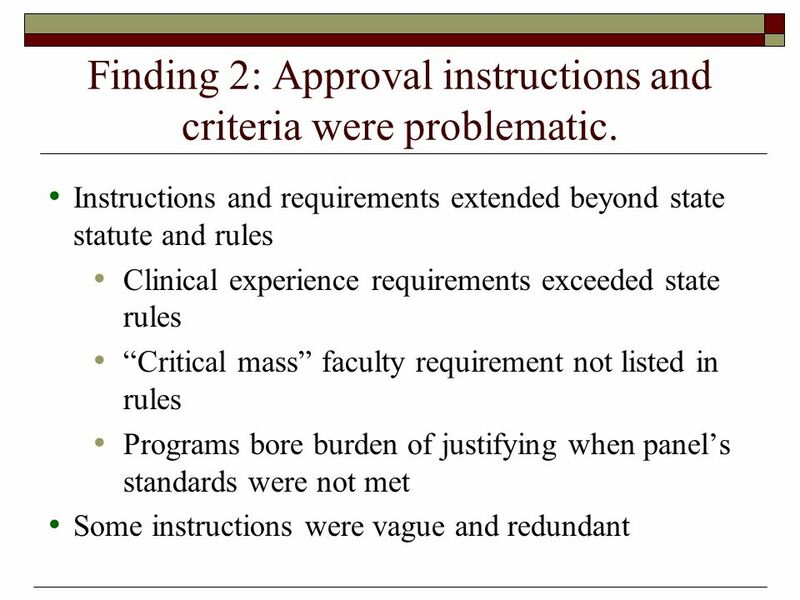 Using this panel raises a question of who should interpret state policy, as well as the abilities of leadership preparation faculty members to accurately foresee which elements will be most important in the review process. 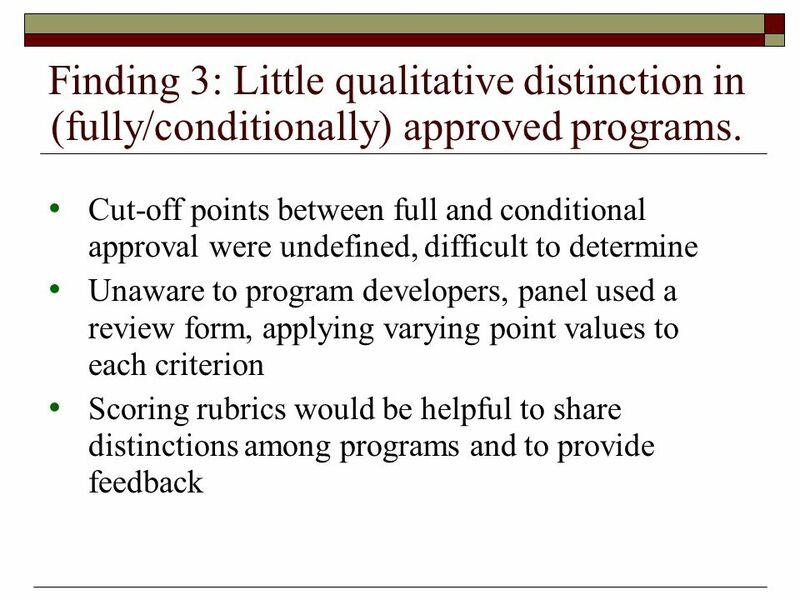 Providing greater definition (precise instructions, consensus on standards, sharing review criteria, scoring rubrics) would greatly reduce the ambiguity inherent in the process. 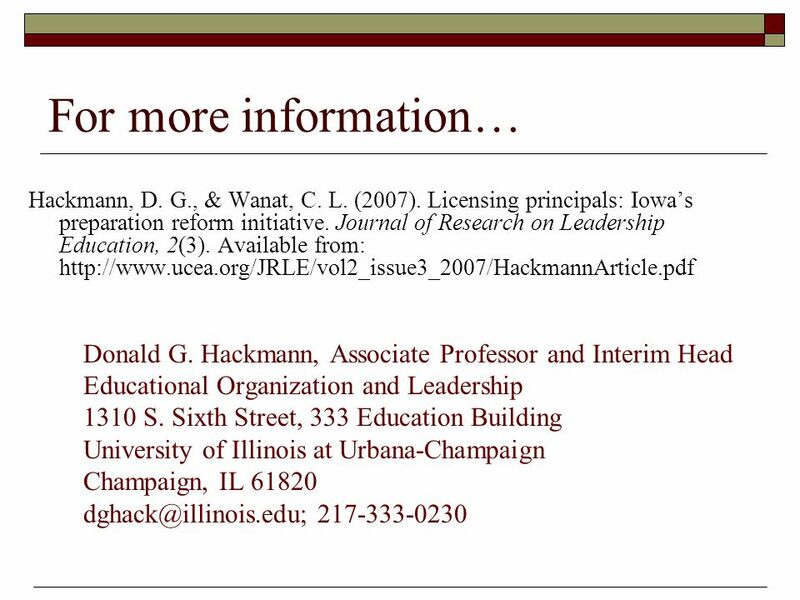 Download ppt "Principal Preparation Reform Efforts in Iowa Donald G. Hackmann University of Illinois at Urbana-Champaign." Writing an IRA/NCATE SPA Report. IRA Requirements Programs must have: –Minimum of 24 credit hours of reading/literacy courses aligned with IRA Standards. 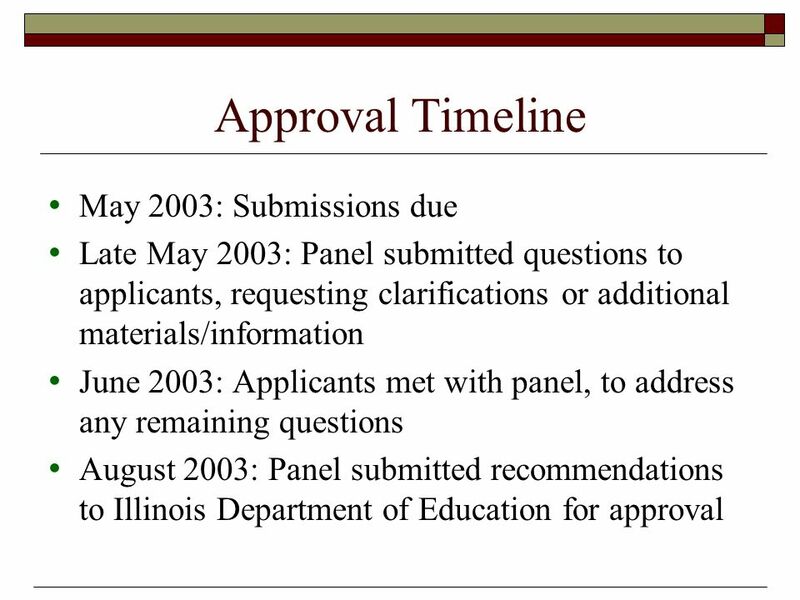 Introduction to Creating a Balanced Assessment System Presented by: Illinois State Board of Education. U.S. Department of the Interior Bureau of Indian Education Elementary and Secondary Education Act (ESEA) Flexibility Request: Summary of Key Provisions. 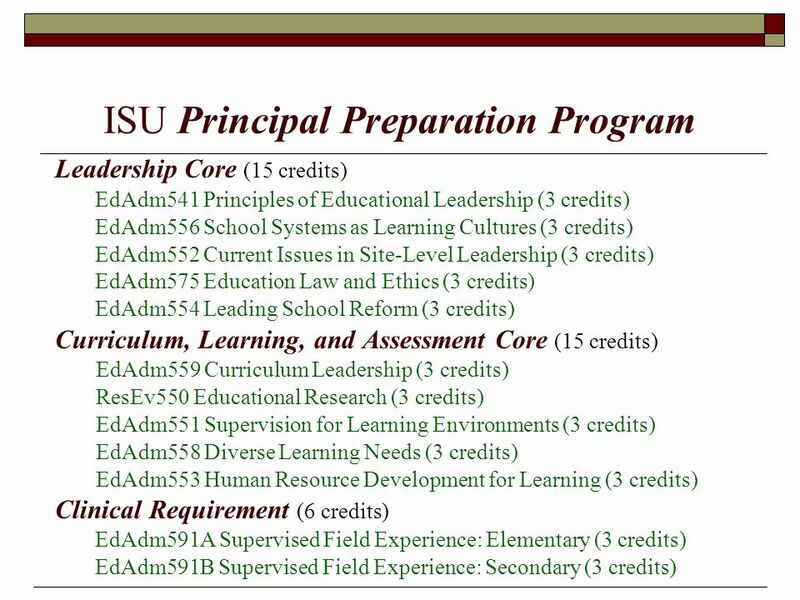 What is Secondary Education at Illinois State University?